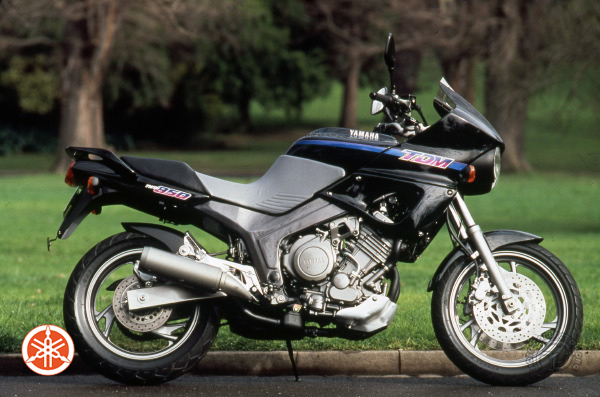 "As far as Nineties bikes are concerned, the times they are a-changin'. After spending the better part of the Eighties concentrating on supersport bikes with ever greater performance and technical sophistication, manufacturers have rediscovered the charm of uncomplicated motorcycles and are offering a more rational new generation of sports bikes. The formula varies according to builder - some are opting for remembrances of things past with nostalgically styled machines like the Kawasaki Zephyr, while others are going for classics in the American style, like the Suzuki VX 800. Yamaha is trying something new with an original, aggressive style that owes something to both the trail bike and the classic machine. Very much in the spirit of that vision is the twin-cylinder power unit, taken from the Super Ténéré and mounted in a steel Deltabox frame inspired by the supersport bikes. The flexible, responsive TDM is at home virtually anywhere, but is at its best on back roads, where its torquey performance is perfect for the terrain. And, with floating front disc brakes operated by quadruple-piston calipers, the TDM's stopping power is among the best currently available, effortlessly bringing it down from its 125mph top speed.